Bipolar disorder (BD) and major depressive disorder (MDD) cannot be reliably differentiated by depression symptom expression alone, suggesting a need to identify processes that may more effectively differentiate the two disorders. To explore this question, currently depressed adults with BD (n = 30) and MDD (n = 30), and healthy control participants with no history of psychiatric illness (CTL; n = 30), completed self-report measures of reward and punishment sensitivity (i.e., behavioral activation and inhibition) and emotion regulation processes (i.e., rumination and avoidance). 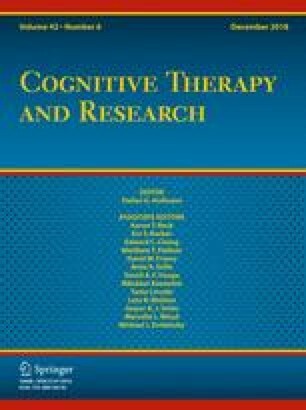 Results revealed that constructs putatively linked to depression across the mood disorders (i.e., behavioral inhibition, negative rumination, dampening of positive affect, behavioral and experiential avoidance) were significantly higher in both mood disorder groups compared to CTLs. Yet there was also some specificity between mood disorder groups, such that the BD group reported significantly greater reward responsiveness and positive rumination, in addition to greater behavioral inhibition and avoidance, compared to the MDD group. These data suggest that patterns of affective responding previously linked to underlying risk for mania in BD may remain evident during a major depressive episode. Further, current models of reward sensitivity in BD may benefit from the inclusion of punishment sensitivity and behavioral avoidance, particularly with respect to bipolar depression. This research was supported in part by Grant K23MH079907 from the National Institute of Mental Health (LW) and Grant UL1RR024139 from the National Center for Research Resources and the National Center for Advancing Translational Science (JG). Lauren M. Weinstock, Tina Chou, Cintly Celis-deHoyos, Ivan W. Miller, and June Gruber declare that they have no conflicts of interest. All procedures were conducted in accordance with the ethical standards of the institutional review committees of Butler Hospital and Brown University, Providence, RI, USA, and with the 1964 Helsinki declaration and its later amendments or comparable ethical standards. Informed consent was obtained from all individual participants included in the study.